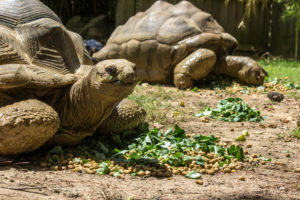 Aldabra tortoises are able to go a long period to time without food or water. These tortoises will wallow in the mud to protect themselves against mosquitoes. Giant tortoises will sleep approximately 18 hours in a 24-hour period. The Aldabra tortoises are the remnants of a larger population of tortoises in the Indian Ocean. There were 18 different species which, because of hunting by sailors and the predation upon eggs and hatchlings by introduced species such as rats, cats, pigs, were all made extinct with the exception of the Aldabra.